You can walk past the most exclusive club in Disneyland -- and thus, the most coveted space of probably any theme park on the planet -- without even noticing it. The price of membership is in the neighborhood of the average American household income. The waiting list is rumored to be years long. And there's nothing to announce its swanky status if you wander past it on Royal Street, nestled amongst the shops of New Orleans Square, right around the corner from the Pirates of the Caribbean ride. The first time I came across Club 33, in fact, I was with my boyfriend. "It's only the most exclusive restaurant in Disney," he explained as he tried to peer through the etched glass panes. I'm a big Disney fan, but a late convert. As an adolescent I shunned the babyishness of it all; in college I latched onto how anti-feminist the whole thing was; and once I moved to New York I assumed life's only Real Experiences required graffiti and/or piss on the sidewalk. Then, four years ago, I met my boyfriend -- himself a fan -- and began acquiescing to trips to the Disney Store, to Disney World -- all that. My "come to Mickey" moment, if you will. To my snobby-hipster horror, I loved it all. But even as I reacquainted myself with the culture of Disney, it was that day in Disneyland that got me curious about Club 33. 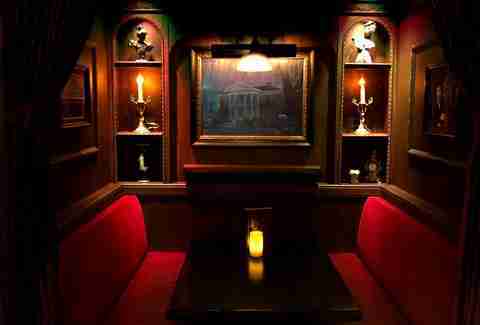 I had to know why die-hard Disney fans consider a meal inside Club 33 a high holy experience. Shy of handing over the equivalent of a down payment on a house, how do people get in there? The answers, like so many things in the House of Mouse, all trace back to Walt himself. And they get more than a little weird along the way. A certain sacredness pervades the air in Disneyland that is hard to appreciate if you're only a passive fan. The park opened in Anaheim, California in 1955, as Walt Disney's original vision of his burgeoning empire. When you visit, you're still in Walt's world, one forged by his nostalgia for growing up in small-town Missouri. And yet, it’s obsessive about the future, always prizing progress. This appetite brought Disney to the 1964 World's Fair in Queens, New York, with his aptly-named “Progressland” exhibition at the General Electric pavilion. There, animatronics reigned at such exhibits as “Great Moments With Mr. Lincoln” (which continues to operate in Disneyland to this day) and with “The Carousel of Progress,” which lives in Walt Disney World’s Magic Kingdom. (The other one you might have heard of? “It’s a Small World.”) The VIP areas at the World’s Fair inspired Walt Disney to conceive a new, perhaps less-progressive vision for his Disneyland park: a members-only club where he could entertain his most important guests. Thus, Club 33 was born. Disney died in 1966, a year before Club 33 opened its doors for the first time. But his vision, design, and dream was carried out, as the Walt Disney Company has done since his death. 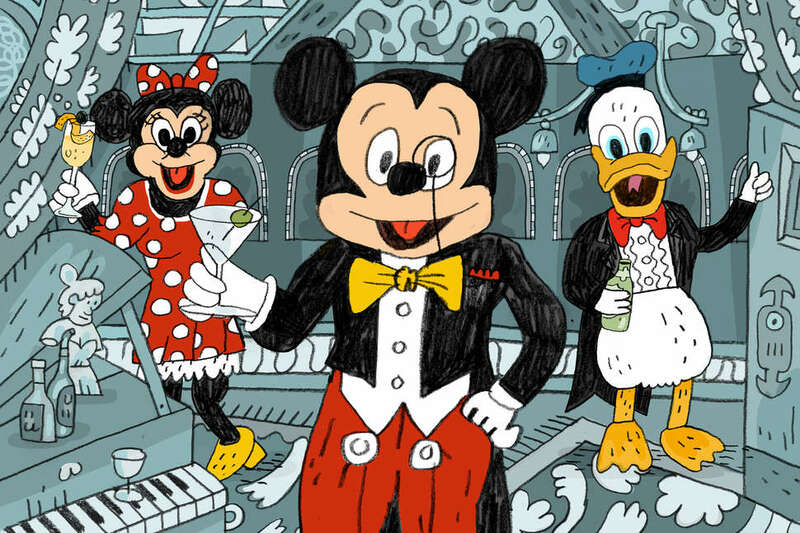 In its 50 years, the club has grown in reputation and status among Disney fanatics to become the stuff of legend. Boasting an alleged initiation fee of $25,000 to $50,000, with annual dues as high as $30,000, and a 10-year waiting list to join, Club 33 is a five-star restaurant and lounge whose members are corporations, high-rollers, and celebrities. It’s rumored that Tom Hanks is a member. Nerdist founder Chris Hardwick, actress Rebel Wilson, and former Playmate Holly Madison are purported members, too. It’s also the only venue inside Disneyland to serve alcohol, and there’s a mandatory dress code. But it’s difficult to confirm any of these details, because everything about the club is shrouded in secrecy. Through Facebook, I reconnected with Billy Murray, my high school classmate and a Disneyland alumnus who was once in charge of training Disneyland character actors. Murray spent seven years as a Disney “cast member,” i.e. employee (and boy do those guys have some interesting stories). He visited the club as both himself and as a character (Peter Pan), an even rarer experience in the world of Club 33 visitors. “As far as the club's purpose, it's more tailored to celebrity clientele, people who need to escape the crowds of Disneyland,” he tells me. “It gives them a place where they can bring the VIPs.” To wit: In 2015, Kanye West and Kim Kardashian took their daughter, North West, to Disneyland for her birthday. During a Frozen sing-along, a cast member snapped a photo of Kanye sleeping through the show. The woman playing Elsa (er, who’s “friends with Elsa,” which is how cast members describe their roles off the clock) posted about it on Facebook, touching off a TMZ teapot-tempest and a PR headache for Disney. “[The company goes to great] extent to make those people feel safe when they're at Disney,” Murray says. “So [Kim and Kanye] were in a safe environment, they probably had bodyguards and stuff all around. And then, there was that one cast member that sneakily took a photo, and then that photo is what upsets the celebrity when they feel like they're being protected by the company.” This makes a private venue for VIPs all the more important. The magic of Club 33 is peak Disney hospitality. New cast members go through three months of training, Murray says; normal Disney hospitality experience is already excellent. (Shout out to the Disneyland Hotel receptionist who, on my last visit to the House of Mouse, was magnificent while dealing with me, a hysterical mess who’d lost her iPhone.) Bojlesen and McPeek describe the Club 33 service as “above and beyond,” with staff who dote while you select your drinks and courses, never rushing you. Oh, and it's also schmancy as all get-out. Club 33’s interior riffs on the 19th-century New Orleans Square architecture, with light blue baroque wallpaper and golden brown parquet floors throughout. 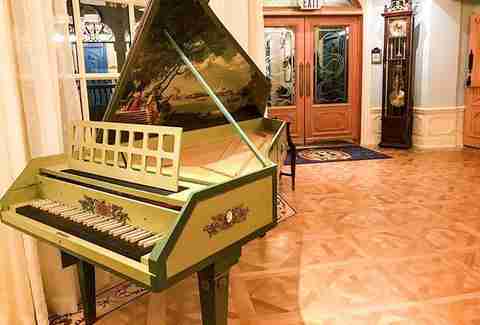 The harpsichord at reception belonged to Lillian Disney, Walt’s wife. Once you pass muster at reception, you enter a large atrium called the Court of Angels before climbing a blue iron staircase to the Salon Nouveau or Le Grande Salon. The Salon Nouveau lounge -- open to non-members only when escorted by a member -- offers an $18 caviar appetizer and a $75 signature hamburger entree, paired with a glass of La Sirena Champagne (or cut the bubbly and opt for just the burger to save a cool $42). The five-course menu at the neighboring Le Grande Salon is a $120 prix fixe and lets the diner choose from diver scallops, steak tartare, duck breast, and saddle of lamb, as well as a variety of salads and the requisite vegetarian selections. The desserts include pumpkin layer cake (how very on-trend), caramel mousse, and “diligently-selected cheeses,” among others. Both restaurants’ bars offer cocktails and craft beers in the otherwise-dry theme park. But you’re still at Disney. To wit: When leaving the club, you’ll have no choice but to exit through the gift shop, which is stocked with ephemera such as Club 33 shot glasses, Pandora bracelet charms, and custom Dooney & Bourke handbags. Members and non-members can purchase challenge coins, which are to be kept on your person at all times. McPeek says if someone walks up to you and “challenges” you, you must produce your coin. If you don’t have it, you owe the other person a drink. So how do you get into Club 33 if you're not a member? If you want to visit Club 33 without spending $50,000? Start asking around. Members can make lunch and dinner reservations for non-members, which makes it at least vaguely accessible for us plebeians. “If you don’t know someone who is a member, good luck getting in,” McPeek says. Don’t know a guy who knows a guy? Try Craigslist. A small number of Club 33 reservations are for sale on the Orange County site, along with some desperate requests from local non-members. Curious to know who might be posting these ads, I replied to each one. I ended up connecting with a couple from Texas under condition of anonymity, for fear of damaging a Club 33 member’s standing. This couple is willing to pay upwards of $1,500 for Club 33 reservations, and hasn’t yet found a member to make the deal. But they worry if their names were to appear in this article, Disney would find out. “I’m sure they frown on members sharing with other people who are non-members,” says the couple. Indeed, they do, especially when money is involved: in 2015, one of Club 33’s original members lost his membership after auctioning reservations for a charity fundraiser. With all things Craigslist, and with Disney, it’s recommended to proceed with caution if seeking reservations via this route. Until the doors of 33 Royal Street shut behind you once more, that is.